Last weekend, when the sky was falling, the pitching was being bludgeoned, and the Oakland Athletics were making the unbearable Boston heat even more annoying, panic was never an issue. 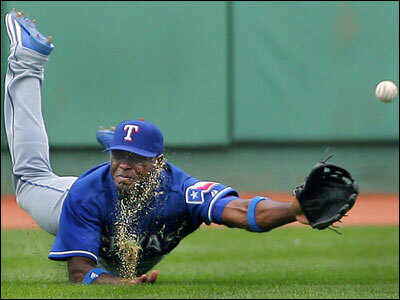 The Red Sox, 1-3 on the homestand after Oakland left town, had the lowly Kansas City Royals in town for three games, then the bleary-eyed Texas Rangers, who arrived early yesterday morning after a Wednesday night game in Toronto. Yesterday, before 36,489 fans, the Sox turned their sour start at Fenway Park into a 5-3 homestand. They followed their three-game sweep of the feeble Royals with a 6-4 victory over the Rangers on a day when Curt Schilling, following back-to-back sparklers by Jon Lester and Josh Beckett, didn't have his best stuff but nonetheless went seven innings to claim his 12th win of the season. ``After Oakland left, we're not feeling too good," said manager Terry Francona. ``You don't set out to be 5-3, but when you're 1-3, that's about as good as you're going to do." The day didn't get off to a good start, as Francona first found out that Mike Lowell was suffering from a stomach bug, knocking the third baseman out of the lineup when Francona already planned to rest designated hitter David Ortiz. Then came a morning meeting with Tim Wakefield, as the two discussed how the ailing knuckleballer (stress fracture in his rib ) would spend at least the next three weeks out of the rotation. But a jiggered lineup -- Alex Cora at third and Wily Mo Peña, playing for the first time since May 26, at DH -- came through in the sixth inning when the score was tied, 4-4. Boston kicked off the rally when reliever Bryan Corey walked Alex Gonzalez, who advanced to second on Cora's sacrifice bunt. After Coco Crisp fouled out to third baseman Hank Blalock, Mark Loretta took a 2-and-2 pitch the other way. Gonzalez, never breaking stride, slid under the tag of catcher Rod Barajas, catching home with his left leg for the eventual winning run. For Loretta, the single erased an earlier gaffe when he failed to slide into home in the third inning after Manny Ramírez's single into right field. In the seventh, the Sox padded their lead after Ramírez walked and Jason Varitek drove in the left fielder with a one-out double. Manny Delcarmen held the Rangers scoreless in the eighth and Mike Timlin, serving as closer because Jonathan Papelbon had pitched the last three games, threw a perfect ninth for his second save, propelling a confident club into their six-game West Coast trip. ``It was a win. A good win," said Schilling, 8-0 at Fenway this year. ``A 5-3 homestand after losing three out of four to Oakland, regardless of who it's against, is a good homestand for us." Instead of the light-hitting Royals, Schilling (10 hits, 6 strikeouts, 1 walk) had to deal with a thumper-loaded Texas lineup that scored three runs in the second to answer Boston's two-run first. Schilling, who didn't have his best splitter, pointed to a two-out mistake against Kevin Mench when he had the Texas DH down two strikes. Instead of locating an 0-and-2 fastball high, Schilling left a pitch in the zone that Mench slapped into right field, putting two runners on. Left fielder Brad Wilkerson doubled in one run with a shot down the left-field line, then Barajas sent in two more with a single to right. ``That lineup is so potent from top to bottom," Francona said. ``They make you work so hard. When you make mistakes, they make you pay." There were times when Schilling looked flawless. In the fourth inning, the righthander needed only seven pitches to put away Mench, Wilkerson, and Barajas. In the seventh, Schilling got Ian Kinsler looking at a full-count, 94-mile-per-hour fastball, forced shortstop Michael Young to fly to right, then ended his performance by punching out first baseman Mark Teixeira with a 3-and-2 splitter, one of his better down-and-out pitches of the day. In those two innings, Schilling resembled the hard-throwing righty who dominated Kansas City Wednesday. ``I've always enjoyed pitching in a rotation when guys compete like that," said Schilling, referring to Beckett's eight-inning performance. ``Earlier in the year I went to Josh, and I don't remember what our win total was, but I was one ahead and I said, `Let's go. Pick it up. I don't want to finish one ahead. You've got to win tomorrow and we're tied.' He was kind of reluctant to say anything, but now it's on. [Wednesday] after the game ends and we're slapping hands, he's like, `Let's go.' I've got to catch him now." But then there was the sixth inning, when Schilling failed to locate his fastball, allowing Mench and Barajas to clang strikes off the Wall, allowing the Rangers to tie the score. Loretta and his mates, however, saw that Schilling's 109-pitch effort wasn't wasted. ``It was good to get the win," said first baseman Kevin Youkilis, who was 1 for 3 with two walks and two runs out of the No. 3 slot. ``I think this team can bounce back from anything. We can go on streaks with wins. When we're playing good, there's not many teams that can beat us."